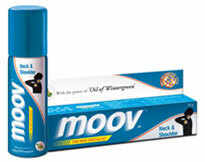 Buy Moov Neck & Shoulder Spray - Pain Relief Spray - Useful Remedy For Neck pain, shoulder pain, sprains, strains & muscular pain. The New Moov Neck & Shoulder with it’s unique ‘Anti-inflammatory System’ acts fast to reduce swelling & inflammation and thus relieves pain. Moov Neck & Shoulder is fortified with the power of ‘Oil of Wintergreen’, which acts as topical pain reliever and provides fast relief from muscle cramps. Moov Neck and shoulders is a non- greasy formula with a pleasant fragrance. Preservatives : Nipagin Sodium & Nipasol Sodium. Neck pain, shoulder pain, sprains, strains & muscular pain. Shake well before each use. Spray the contents from 5 cm distance on the affected areas 3-4 times a day. Do not spray on open wounds. Flammable. Pressurised container. Keep away from heat and sunlight. Do not expose to temperature exceeding 50oC. Do not pierce/burn even when apparently empty. Do not spray on naked flame or incandescent material. Do not spray near eyes or face. Avoid direct inhalation. Harmful if taken internally. Keep out of reach of children. Replace cap tightly.